Baghdad – Iraq’s parliament approved a law on Saturday that will transform Popular Mobilization forces (PMF) into a legal and separate military corps, amid opposition from different Iraqi parties. 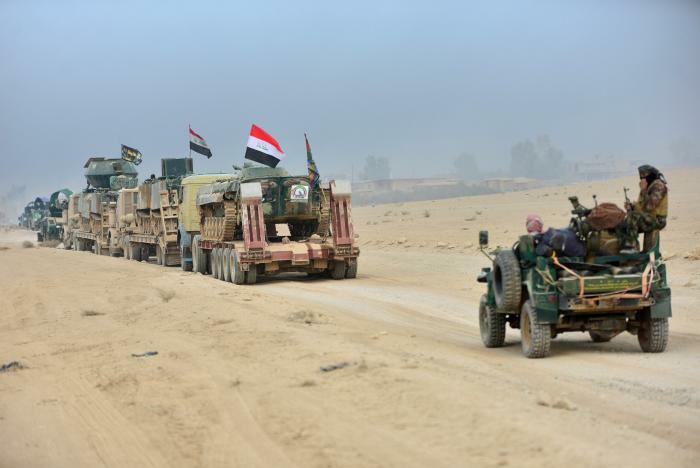 Disagreements over the semi-military units complicate efforts to pull Iraq together as forces battle to defeat ISIS, that overran a third of the country in 2014 and extended to parts of Syria. Out of the 328 MPs, only 208 attended the session with 170 members voting with the law. Reuters reported that PMF was accused of abuses against Sunni civilians in towns and villages retaken from ISIS, according to international human rights groups and the U.N. Human Rights Commissioner. “As it stands now, it would constitute something that looks like Iran’s Revolutionary Guard,” he added. Vice President Osama al-Nujaifi said that there should be a real partnership and agreement among everyone in the country. He rejected this policy and called for reconsideration saying that this weakens the Iraqi state and violates the regulations and partnership in the country. Speaker Salim al-Jabouri, who is one of prominent Sunni leaders, said that all blocs of the parliament do not disagree about the importance of granting fighters their rights. Yet, he pointed out, that the law doesn’t grant anyone immunity and will question, according to military laws, those who violated human rights. Kurdish Forces and PMF are supporting the offensive, as well. The law does not stipulate how many fighters will be incorporated under the legalized Popular Mobilization corps, which currently claims to have more than 110,000 fighters. Iraqi government says there are between 25,000 and 30,000 PMF members from Sunni tribal fighters and nearly all the rest are Shiites, with a few Yazidi and Christian units. Kurds have their own military force, called Peshmerga, deployed in the Kurdish autonomous area in northern Iraq. The motion named “Law of Command of Hashid al-Shaabi and other Armed Groups,” has the Iraqi Ministry of Finance provide the militia with monthly payments under the Commander in Chief of the Armed Forces, Iraqi Prime Minister Haider al-Abadi. Iraqi PM is a Shiite under Iraq’s governing system that divides top state positions between communities, which was devised after the 2003 fall of Saddam Hussein. Usually, the army reports to the defense minister, traditionally a Sunni. Yet, the position has been vacant since the parliament sacked former Minister of Defense Khaled al-Obeidi in August. The law specifies that the PMF has the right to preserve their identity as long as this doesn’t pose a threat to Iraq’s national security. The law allows the PMF and their formations to assume their military and security duties and activities, upon a request from Iraq’s armed forces commander when they are needed to provide support if there is a threat to the country. They are also allowed to take any measures required to deter terrorist and security threats facing Iraq so as to liberate cities from terrorist groups and their supporters. The act also stipulates that the PMF’s staff and victims have the same privileges of Defense and Interior Ministries’ staff. Abadi welcomed the law saying PMF is now under direct orders of the Armed Forces, which sets its regulations, and represents all Iraqi people and defends them wherever they may be.